Red signifies good luck and prosperity and I just like red, so lots of it! That’s a lovely, round lacquer box for crystallized snacks. Year of the Tiger falls on the same day as Valentine’s Day this year! So, there are many, many events around Miami. I have 4 events scheduled (see below), so I won’t have time to cook for my friends or organize a gathering this year. 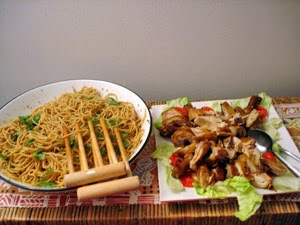 But here are some dishes I made from previous Chinese New Year celebrations. 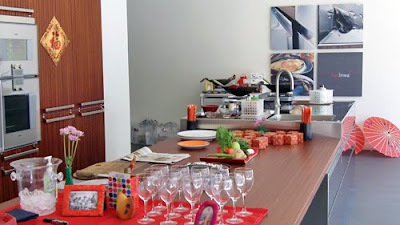 I actually did manage to cook a cozy, simple dinner for my sister and husband and will post in a separate blog: Chinese New Year – simple home dinner is best! 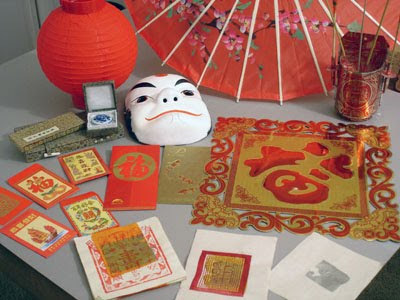 Visit your Asian market and get red packets and decorative stuff to put all around your house. and Roast Chicken from the Asian market (easy). Well, I already broke my no.2 resolution which was to call 3 Wok Stars a week! No. 1 resolution was to “open my umbrella” and be more “open” to new ways of doing the same thing. So, now I’m going to add no.3 resolution which is to CHANGE the way I do things. I read this quote on Twitter and it was an “AHA” moment. It was something like: To succeed, focus on CHANGE not RESULTS. CHANGE is good. I love to stir things up, so this year I’m going to be full of CHANGES. For Tiger folks, here’s one to help Tigers get together and stay together. I can’t vouch for the accuracy or anything but fun to scan through. Bee of Rasa Malaysia is one of my favorites, it is beautiful and has a Chinese New Year series from a variety of guests. Jaden Hair of Steamy Kitchen does an incredible job with step by step photos. If you’ve still not bought her book, there’s a 40% discount on her Steamy Kitchen Cookbook if you hurry. She gave me a nice mention in her book, thanks Jaden! Andrea Nguyen, recently had her book published, Asian Dumplings. 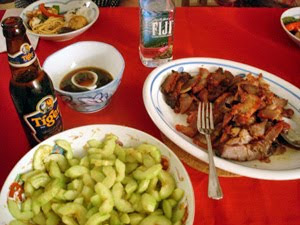 Her Viet Kitchen blog is full of Vietnamese foods and stories. Here’s her Year of Tiger traits, horoscope etc. 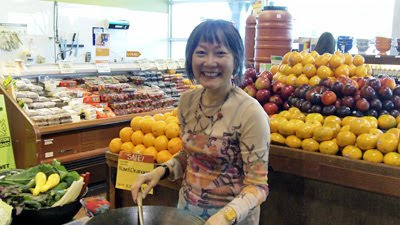 Diane Kuan, an accomplished writer and cooking teacher listed the Chinese New Year Foods – Top 10 picks. Jen Lee was a research lab scientist so she loves to experiment. 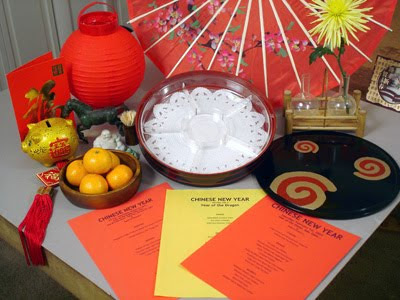 Here are her Chinese New Year Recipes. 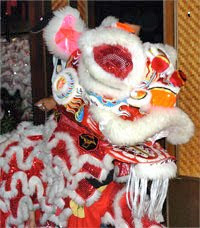 Paula Nino of Mango and Lime listed a number of Chinese New Year events around Miami. Ready for CHANGE? Try my NO-RECIPE approach for weeknight dinners. Using a few fresh ingredients and seasonings is all you need for weeknight dinners, all cooked in a cast iron wok. 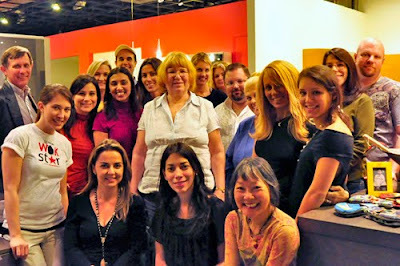 Scenes from last Saturday’s class. Chinese New Year setup at Arclinea. Thanks to Arclinea for hosting me, always fun there! Soy sauce chicken and Char Siu from the Asian market. Thanks Christine for sharing your wonderful photos and making it a “live” twitter event. 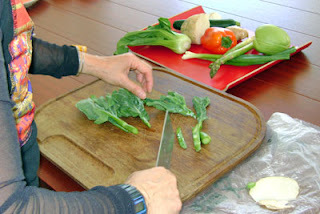 I demonstrate how to “cut” vegetables Asian style. 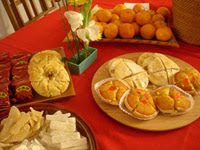 A selection of Chinese cakes: coconut tart, bite size almond cookies and melon pastry. Here are my photos from the class at Arclinea, enjoy! 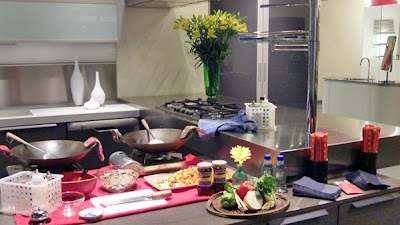 Tall orchid arrangement made a dramatic presence in the beautiful Italian kitchen showroom, so welcoming and cheerful. Thanks to Pedini Miami for hosting me and all the work you put in to make this happen. I was also honored that David, the GM came fro Sarasota to experience this event. Plenty of drinks especially Gancia Prosecco and Fiji Water to go with my Rainbow Lettuce Wrap appetizer while everyone got to know each other. 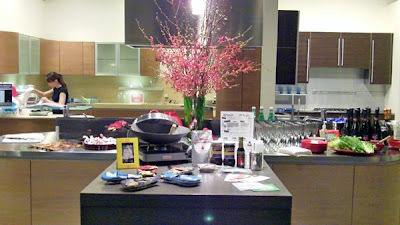 Two cast iron woks and 2 portable gas stoves setup ready for Wok Stars and the big sizzle! Soy chicken and Char Siu are usually warmed in the microwave but I was so excited about scoring this new venue, I forgot to ask if they had a microwave oven! I solved this quickly by having Hayli (my assistant who keeps me sane and a Johnson & Wales culinary graduate, see her in Wok Star tee below.) 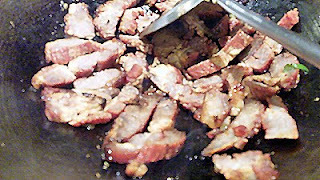 to warm chicken in the rice cooker and I warmed up the Char Siu in the 2 woks, worked out perfectly! It’s actually how I like to warm up roast meats from the Asian market at home, so much tastier. Another great use of my cast iron wok. “Graduation” photo by Angie Chen, see more photos. Angie is studying to be an art director at The Miami Ad School and kindly took photos at the class. Here are my photos on Flickr. Lots of you enjoying Rainbow Lettuce Wrap Appetizer, thanks for coming. Thanks to Plum TV, Megan Harris for promoting this class on 5 best things to do this week! If you’re interested to take my Wok Star cooking class with me, all the photos will give you a good idea of how I run my class. I’ll choose from a selection of fresh veggies and protein to show quick, easy, one-dish dinners cooked in my cast iron wok. Check out other demonstrations! Chef Douglas Rodriguez is right after me. My buddy, Chef Hugh Sinclair is on at 4pm with his delicious Caribbean dishes. Thank heavens my sister came to help me out, I used my oil to fry an egg for breakfast and didn’t put it back in my caddy! I got my sis to run to the Creperie booth to get some oil. BTW, next time you go to this festival, get the Skirt steak with spinach, mushrooms and cheese, it was very good, tender big chunks of beef. I was recommending to everyone. FREE DEMO in Produce Dept. Join me in the Produce Department where I’ll be showing how to make healthy, easy, one-dish, weeknight dinners. Using my NO-RECIPE technique and Wok Star Kit to “mix and match” a variety of fresh veggies with grass fed beef and shrimp. My Squirt, Squeeze, Shake of a few seasonings is all you need for a simple and yummy, sizzling stir fry meal that even picky kids will eat! I’ll post about what I learned from this demo soon! That’s why interacting with a live audience is so important, I learn what problems people are having with their wok cooking or “what’s for dinner?” syndrome. P.S. Just got a nice email to say they “loved having” me there and invited me back in May, yay, will keep you posted.